In the category of things requested were the latest mystery novel by my distant cousin, Cynthia Riggs, whose house on Martha’s Vineyard I wrote about last June; a very back issue of Historic Nantucket, the magazine of the Nantucket Historical Association; and a book published this year by history professor Everett U. Crosby. Cousin Cynthia’s newest book is called Widow’s Wreath, a title that is sadly appropriate since her husband passed away in February 2017. Their late-in-life courtship was a romance for the ages, and my husband and I were honored to be guests at their house only a couple of weeks following their marriage on Memorial Day weekend in 2013. The tiny black-and-white 1976 issue of Historic Nantucket I received is a mere shadow of the contemporary full-color publication by the same name, but it has lots of good information. I particularly enjoyed reading testimony given about the “Boston Tea Party” to the Lords of the Privy Council in February 1774 by Francis Rotch (whose family owned two of the three ships involved). It was especially thrilling since I discovered a receipt from his brother, William, to my great-great-great-great-great-great-grandfather when I visited NEHGS this past September. 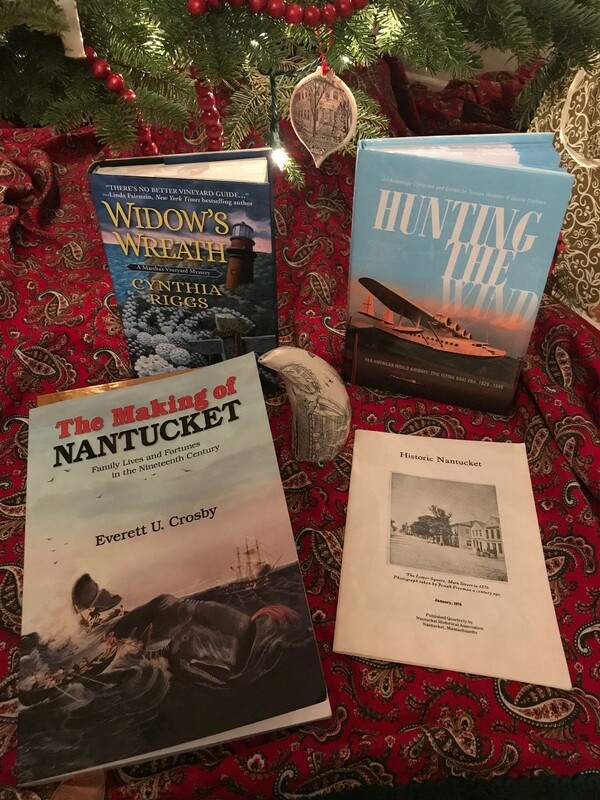 Everett U. Crosby’s The Making of Nantucket: Family Lives and Fortunes in the Nineteenth Century definitely did not disappoint upon being unwrapped! It details the life and connections of Matthew Crosby (1791–1878), whose first wife was the sister of Henry Coffin, the husband of my great-great-great-grandmother’s sister, Eliza (Starbuck) Coffin. Thankfully this book has an index, so I was able to get straight to the parts concerning my immediate family members prior to commencing a complete read-through of its 250 pages. 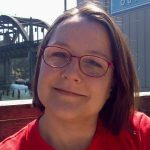 The author was attracted to studying Matthew Crosby due to their shared surname … though their most recent common ancestors lie somewhere back in the mists of Olde England. I will have more to share about what I learned in the future (it’s juicy)! Two completely unexpected gifts came from my older son and my aunt. My son (who filled a perceived deficiency in my family history collection last Christmas by giving me a decorative harpoon!) came through this year with a simulated scrimshaw whale’s tooth. And my aunt sent me a copy of the newly-published Hunting the Wind: Pan American World Airways’ Epic Flying Boat Era, 1929–1946. Chapter seven was written by my aunt, detailing her evacuation – along with my father and grandparents – from Noumea, New Caledonia, in December 1941. I learned several new details of this exciting adventure, and Aunt Merry’s story includes a picture of my grandmother enjoying a casual meal on the ground with friends, which I’d never seen before. I’m so thankful for being able to spend time with my family this past December, and I hope Genealogy Santa came through for you, too! There is a story behind the bank ornament. Nantucket’s Christmas tree is erected each year in front of the (real) bank building, which was built in 1818. This means that it has been 200 years since the Athearn family moved into the bank cashier’s on-site accommodations! Great gifts! 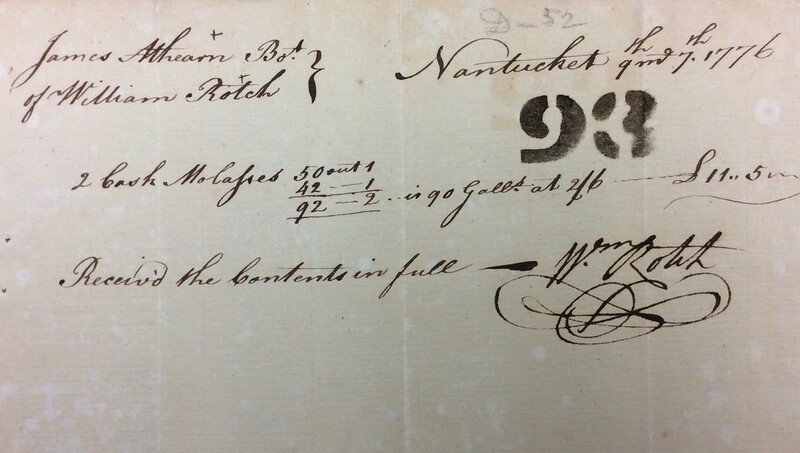 Is there much about the Coffin family in your book “The Making of Nantucket”? Tristram Coffin was my 9x great-grandfather. May be a good read! More Coffins than you can shake a stick at! Matthew Crosby married a sister of Charles G. And Henry Coffin, whose houses and legacies are still well-known on the island. You didn’t ask, but Cynthia Riggs’s mother was also a Coffin (and named for old Tristram’s wife Dionis): poet Dionis Coffin Riggs. Very cool – thanks Pamela! I may have to pick up the book :-). I would love to know if the book mentions Phebe A. Hanaford. I have no genealogical connection to Nantucket, but Phebe Hanaford is an incredibly interesting and well-known personage. If the book talks about her and/or her family I’d be interested in reading it too! Plus, I have several Coffin-descendant friends.Thanks for this post, very interesting! I’m afraid that she and her immediate family are not referenced.